The central goal of this project is to improve systemic therapies for non-small cell lung cancer (NSCLC) using combinations of potent anticancer agents, chemosensitizers, and agents that target the tumor microenvironment (TME). Many highly promising small-molecule cancer-targeting therapeutics fail due to poor solubility, stability and other delivery related problems. Recent advances in nanoparticle (NP) drug delivery vehicles provide a unique opportunity to “rescue” these agents for clinical application. This is the focal point of our research, which is to use NPs that can incorporate such agents and preferentially deliver them to tumors. Our group has successfully developed a novel drug delivery platform based on poly(2-oxazoline) (POx) polymeric micelles, that is well suited for the delivery of poorly soluble active drugs, such as paclitaxel (PTX). Compared to conventional formulations and other NP platforms, our POx platform is unique in its high drug loading capacity. Our preliminary data showed that such high drug loading translated into lower toxicity and high therapeutic efficacy when we compared POx/PTX to both Taxol® and Abraxane®. The National Characterization Laboratory has evaluated the PTX formulation using our lead POx block copolymer of poly(2-butyl-2-oxozaline) (BuOx) and poly(2-methyl-2-oxazoline) (MeOx), and concluded that both the copolymer and formulation lack immunological and hematological toxicities. Significantly, we have shown that multiple agents can be co-formulated within the same POx micelles, enabling co-delivery of anticancer agents, chemosensitizers, and TME-modifying compounds. Such combinations can increase cancer cell cytotoxicity and modify the TME to enhance tumor control. We hypothesize that POx micelles can serve as a powerful and versatile platform for delivery of such agents. We assembled a cross-disciplinary team of physician-scientists and experts in nanotechnology, pharmacology, and chemoinformatics, and will focus our research efforts on using POx micelle therapeutics in NSCLC, a disease that despite treatment advances, still has a very poor outcome. The Specific Aims are: 1. Develop a predictive computational model for rapid selection and incorporation of new and existing anticancer agents, chemosensitizers, and TME modifiers into POx micelles. 2. Evaluate chemosensitizers and anticancer agents incorporated in POx micelles as therapeutic modalities to improve treatment of NSCLC. 3. Evaluate polymeric micelle formulations of agents that target the TME as a treatment strategy. 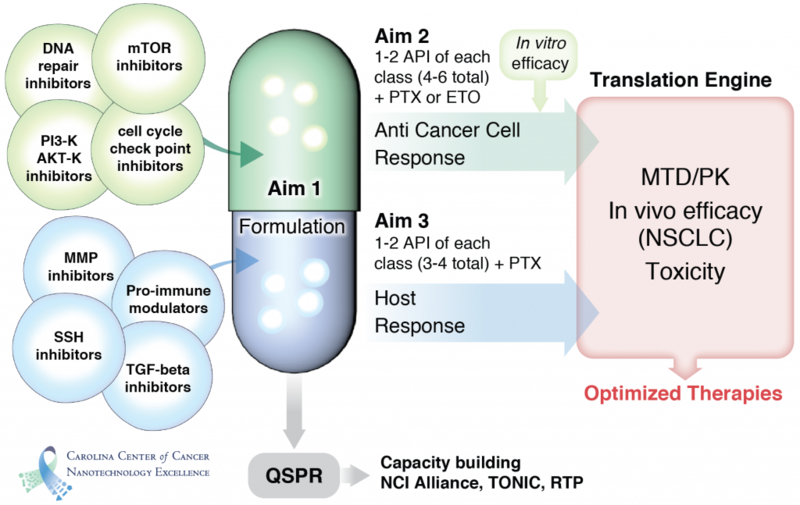 The computational model for rational design of formulations will drastically increase the throughput and allow us to further develop new anti-cancer therapeutics through trans-Alliance collaborations and other NCI mechanisms. Successful therapeutics will be advanced for further development.